The 3rd annual “Washoku Matsuri: Japanese Food Festival” on Monday, November 29th, 2010 at the Kobayashi Hall of the Japanese Canadian Cultural Centre. This special event brings together some of the top Japanese chefs in Canada to personally serve you authentic signature Japanese dishes that has captivated foodies and culinary experts alike. As part of the evening, you will enjoy a fantastic line-up of Japanese traditional arts for entertainment; Taiko and Iaido demonstrations, as you taste food from all the chefs. Through out evening there will be cooking demonstrations, introducing key Japanese ingredients and cooking techniques. Expressing the connection between food and culture in Japan and health benefits of Washoku cuisine. 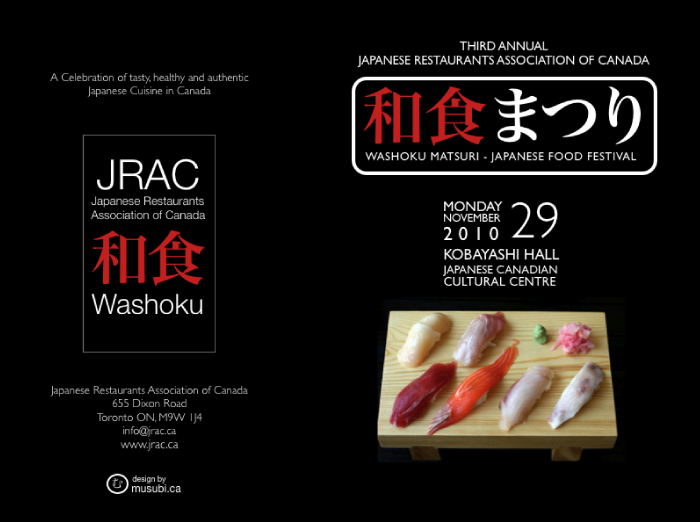 Supporting these chefs as part of the JRAC fundraising efforts will deepen the understanding of authentic Japanese food and culture to Toronto, which support new programs and educational seminars to culinary students and diners alike. We look forward to seeing you at our 2010 Washoku Matsuri!